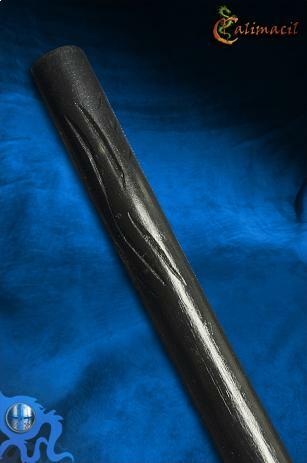 The black Kali Staff is perfect for the woodsman or rogue. 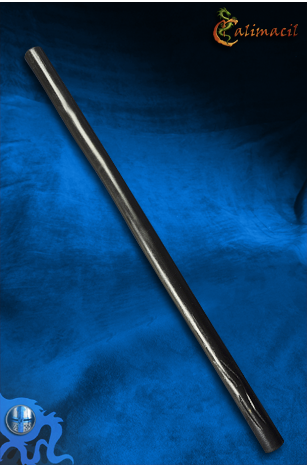 Useable in various LARP settings, this basic weapon works best in the offhand, defending against attacks. Fashioned to resemble a smooth wooden texture, the Kali Staff is a combat-safe weapon composed of a sturdy fiberglass core and reinforced with foam. Weighing slightly more than half a pound, this weapon is marked for quick defense though also serves faithfully when wielded as part of a pair. The end of the staff includes engravings. Consider this weapon for any character who might use makeshift weapons fashioned in the woods: hunters, elves, earth spirits, and more. This Kali stick is a bit denser and slightly sturdier than the Yantok Kali stick.